The R-09HR is the latest addition to Edirol's range of portable recorders. 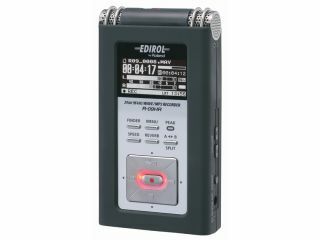 Edirol has a new handheld digital recorder in Frankfurt: the R-09HR. This can record at up to 24-bit/96kHz quality, has a built-in stereo condenser microphone and comes with a speaker that enables you to preview your recordings instantly. Offering direct to WAV or MP3 recording, the R-09HR sports a high-contrast LED screen. Notable features include a speed control, a variable low-cut filter, A-B repeat, record pause, time and date stamping, power saving and more. You even get a remote control. Edirol says that the new device can record for up to six hours when powered by alkaline batteries and eight hours when it´s got NiMH batteries inside it. You can plug in SD/SDHC media cards of up to 32GB in size, and you can edit your recorded files in the copy of Cakewalk´s Pyro Audio Creator LE that comes supplied. No word on a price or release date as yet, but you can find further details on the Edirol website.